With the perfect scores stacking up and the praise still coming in strong almost a month post-release, it’s clear that, like its predecessor, Red Dead Redemption 2 is going to win every award, all the awards! Reviews of the game praise EVERYTHING; from the gorgeous environments that truly are alive in a way I have seen in no other game, to the amazing score that pairs beautifully with the story line, often so perfectly that truly emotive moments are born. Some have found the pacing to be a bit slow, but I think Rockstar have deliberately created a balance – forming a sense of urgency in a world that was slow-moving – forcing the frustrating inconveniences of the time period onto the player. But even those who note this as a complaint, do so as a side-note to what is otherwise epic praise! All this to say, RDR2 is game of the damn year! To be honest, I wasn’t expecting anything less. I don’t think I’ve had that unique feeling of ‘Christmas Morning!’ since I was age 11 or 12, but that’s the exact feeling I had picking up my copy of RDR2! I knew the game was going to be huge and awesome. What I didn’t know was that the story was going to be all about John Marston! I knew John was going to be in the game, but I figured the focus of the story would be on new protagonist Arthur Morgan, and on the surface it is. 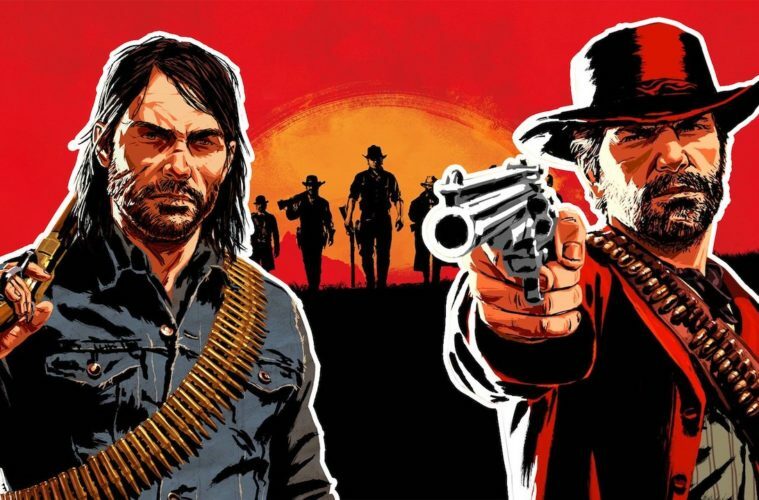 Scratch just below, and it becomes plain that from the very outset, this story and Arthur’s journey, serve to deepen and strengthen the story of John Marston and the players’ connection with the character. This thread is so strong and consistent throughout RDR2 that it felt like a gift or a reward for dedicated RDR fans. I sometimes even wondered if people who hadn’t played the first game would come away feeling a bit confused or alienated. Right from the opening chapter weight falls on John as Rockstar teases his introduction into the game with ‘search and rescue’ style tension. When we finally see our old friend, we’re also delivered the origin story of his infamous double cheek scar. I think I actually screamed out loud at this revelation. Treats like this litter RDR2. 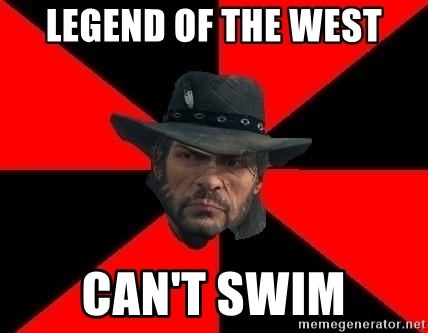 We see John acquiring skills he exerts with ease in RDR1, there are multiple meta-quips about his inability to swim; an element from the first game that spawned Red Dead’s most well-known meme series. Consistently throughout the storyline emphasis is placed on John’s character. There is constant concern for him and his family from Arthur and other members of the gang. Even when separated from the group focus stays on John as other characters discuss and speculate about his activities. 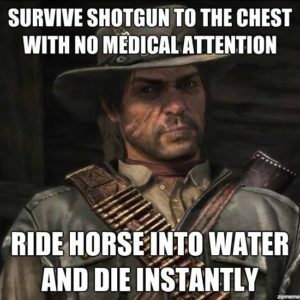 The best example of this is in the Guarma chapter; Dutch makes a subtle suggestion that John may be acting treacherously; an accusation that serves only as a red herring in RDR2’s story line, but carries far more gravity for players of RDR1 as something that could possibly redefine how we feel about John Marston – and not in a good way. How we feel about John is another clear indicator that RDR2 is all about him. We play as Arthur, sure, but do our feelings about him ever really change? Does HE ever really change? Not really. Arthur is a good dude and he stays a good dude. Everyone changes around him, but Arthur stays true. It is John who goes through the character arc of personal development that causes us to form an opinion about him and then change it as we see him grow. In the opening chapters of RDR2, its blatantly obvious that we are not supposed to like John. He is depicted as unreliable, irresponsible, a bad husband and father, possibly even a traitor. As the story unfolds, we see John change and grow. We see him become the man we were introduced to in RDR1. By the end of the story, we’re on John’s side – possibly ashamed to have ever doubted him. With RDR2 being all about John Marston, it might seem as though I found Arthur Morgan a boring or superficial protagonist – not the case. Playing as Arthur was a great time and I loved learning about him, but I firmly believe that playing as Arthur ultimately led to a stronger understanding of who John Marston is – stronger than we ever understood about Arthur himself. Arthur is a big brother figure for John. Experiencing his journey firsthand is an education into why John Marston is the man he is and why he embodies the positive qualities he does. Arthur’s storyline just barely introduces the idea that he had a wife and son who died. Introducing this information primarily gives more depth to Arthur’s character, but it also becomes relevant to John’s character development. It’s not hard to imagine John being moved by Arthur’s experience to try and work for a better outcome for his own family. Arthur also drives John’s story along; especially in the latter chapters where his entire motivation for not succumbing to the illness ravaging him is to keep John and his family safe. We learn that Arthur’s actions and sacrifices are what allowed John to survive. We understand what John owes to Arthur and the legacy he is upholding when we play as him in RDR1. Arthur Morgan was a delight to play. I can’t wait to learn more about him as I inevitably replay RDR2 a zillion times. But it was having the chance to know the man who was such an important role model for John Marston, that I appreciate the most about Arthur after this first play-through. Though, you know, it would have been nice if John had also picked up on Arthur’s horse bonding qualities…. Just in case the main story didn’t quite drive home the message that RDR2 is all about John Marston, the 15-hour strong epilogue will do the trick. This part of the game – that you play through entirely AS John Marston – blatantly and gloriously panders to fans of RDR1 – it’s the biggest present under the tree! I’ve tried to imagine what it might like playing RDR2, especially the epilogue, without having played the first game. I can’t do it. 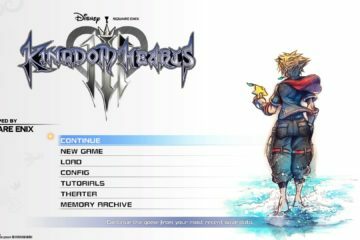 The main story sure, it’s obviously fine, amazing even, as a standalone game. But that epilogue. What will greenhorns make of it? 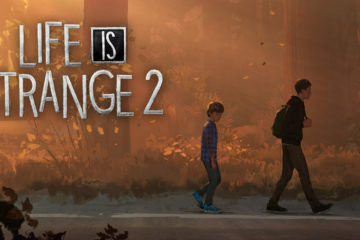 Will they be inspired to play the original? I hope so. They have been given a unique opportunity to experience and interpret Red Dead Redemption in an entirely new way; a way inaccessible to long-time fans. I might even be a little bit jealous. Already available to play on Xbox One & PS4 (via PSNow), I would love to see RDR1 given a remaster and proper re-release on these platforms to offer an enhanced experience to people who want to visit or revisit the game in light of the events of RDR2. No rush though; RDR2 is massive enough to keep people busy for a long time yet. With Red Dead Online beta launch on the way, we haven’t yet seen everything Rockstar has to give us!